I can’t believe that I had the #1 video on CMT.COM. I knew that many country radio stations were playing the Christmas Song already but I was still surprised to see that for a brief moment, my video was #1 on Today’s Top Videos! It was such an honor for me and such an incredible feeling to be on the same list as Toby Keith and Luke Bryan … words alone cannot describe how excited I was to see my name up there and I am so grateful to CMT for giving me this opportunity. On Sunday, October 2nd, I took a flight from Nashville to Los Angeles, California to prepare for my West Coast radio tour to promote the “Me Time” single. Our first stop on Monday October 3rdwas 107.9 KUZZ in Bakersfield, CA where we met up with program director Evan Bridwell. I performed for the staff in their conference room and he invited me back to perform at the Crystal Palace nightclub they have directly in front of the radio station. It was amazing to hear how country music legend, Buck Owens, established KUZZ as the first FM country radio station in Bakersfield, California. Before we left, I made sure to take a photo with the life-size statue of Buck in their main lobby! We then drove up the coast and stopped by 106.7 KJUG Country in Visalia where we met up with program director Adam Jefferies and on-air personality Lisa Hamilton. They were really great people and shared a really funny video with us about a “waffle house boy” (you had to be there to understand, LOL). 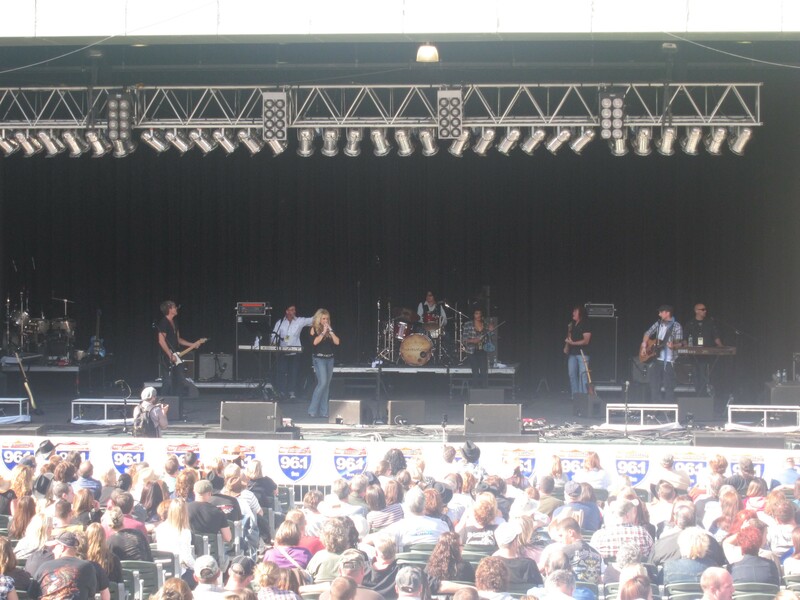 We were then off to Modesto, California where we visited 103 KAT Country with program director, Nikki Thomas and played for her entire staff. Overall, California was an amazing trip and well worth the visits. On Tuesday October 4thwe went to 95.3 KRTY San Jose Hot Country to perform for program director Julie Stevens. The KRTY offices are located in front of a small farm and since we arrived early, I got the chance to pet a few horses! Julie was such a great lady! I especially liked how she said being a mother made her really relate to my song “Me Time” and I was glad to hear that. We performed another 2 songs for her and then we were off to 105.1 KNCI New Country in Sacramento, CA to perform for program director Byron Kennedy and music director Matt Vieiera. It was really great that a good portion of their staff joined in the conference room for our performance because afterwards, I did a little Q & A for them. I enjoy answering questions from the radio stations and like to feel that personal connection with the people I meet on the road. and on-air personality Charlee Simons. This is a really fun radio station! The people are so nice and welcoming and I had a BLAST recording “liners” for their station … (I especially liked how I had to howl like a wolf on some lines! LOL!! )On Wednesday October 5th, weboarded a plane to Salt Lake City, Utah and met up with program director Debby Turpin of Z104, KSOP and her staff. 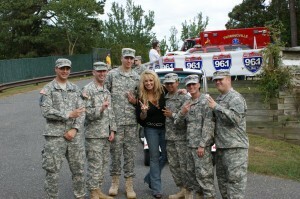 It was a really great visit and I was humbled when Debby said she really loved my voice. I mentioned that I was recording a Christmas Song and she asked me to send it to her when it was complete! We took a few pictures with the staff and then headed out to 101.5 The Eagle, KEGA in Salt Lake City to perform for program director Alan Hague and music director John Watkins. Both gentlemen were so sweet and enjoyed the songs we performed for them. We also took a few photos with them and headed back to the airport. I have never been to Utah before, but it was such a beautiful state and the people are so nice and friendly…definitely worth a return visit one day soon. Then on Thursday, October 6th, we headed to Denver, Colorado to meet up with 92.5 The Wolf – KWOF. We performed for program director Jonathon Wilde in a beautiful studio with a stage and full PA system. It was one of the nicest studios I have seen. We then met with on-air personality Mud Flap and had a few laughs as I attempted another wolf howl on the station liners!! to 99.5 The Wolf-KWJJ to perform for program director Michael Moore and music director Savannah Jones. Before we arrived, we made a quick stop over to Voodoo Doughnut in Portland. If you have never eaten a Voodoo Doughnut before, well, YOU NEED TO!!! We brought two dozen donuts over to the station and did a performance for the staff in their HUGE conference room. After this visit, we headed over to 98.7 KUPL to perform for program director Scott Mahalick. This visit was quite amazing…KUPL has a studio on the first floor that is sponsored by BING and it was like a mini theatre! The sound system could rival a concert hall and the stage was just incredible. After Joey and I performed, Scott thought it might be cool to “surprise” the accounting staff on the 6th floor with an impromptu performance throughout their office. Joey and I happily agreed and we all quietly went to the accounting floor and started singing “Me Time” in the main accounting office. People were coming out of their offices to see what was happening and stayed to watch us perform 3 songs! Afterwards, I signed pictures for the staff and posed for a few photos. It was a GREAT! Scott explained how the employees rarely get to see or hear the artists that come into the studio and he wanted to treat them to a private performance .. it was a wonderful experience and I am really looking forward to returning to Portland again soon .. and to Voodoo Doughnuts. What an amazing summer this has been! On September 28th, I spent five days in Nashville promoting my “Me Time” single and meeting with many “movers and shakers” in country music. I had the opportunity to attend my first CMA Membership Event at the Red Rooster and had a nice time chatting with CMA President, Steven Moore. The next day, we met up with two of the nicest people at CMT, Leslie Fram and Bryan Bayley. I gave an impromptu acoustic performance on the (surprisingly) vacant sound stage at CMT for Leslie, Bryan and a few CMT employees. That was such a great experience! Even though the cameras weren’t rolling, I could still feel the energy on the stage from the country music artists who performed before me. Bryan and Leslie were so sweet and I’m really looking forward to meeting up with them again in Nashville for the CMA awards show in November. Next on our stop was a visit to Country Music Weekly and Country Aircheck. My guitarist, Joey Sykes and I performed a few songs for the staff and had a great time hanging out afterwards to talk with them. It’s very encouraging to know that this journey I am on is receiving so much positive feedback from everyone we meet. During my Nashville trip, we went into the recording studio to meet up with the musicians who are playing on the two new songs me, Joey and Don Rollins co-wrote together on my last visit to Nashville. The musicians were so amazing and we finished the rough tracks to both songs in under an hour! I can’t wait for everyone to hear these two new songs! Becoming a Member of the CMA – Country Music Association in Nashville! Wednesday, August 30th was an important moment in my country music career. I went down to the Country Music Association in Nashville to officially sign my CMA membership papers! Becoming a CMA member is a great honor for any country recording artist, but it was an especially big accomplishment for me as a country artist from Long Island, New York. The CMA invited me to come back at the end of September to Nashville for a party honoring all of their new members. The next day I went over to Renegade Radio in Nashville, right on Music Row. Renegade Radio is one of the top internet country radio stations, founded by deejay, Kaptain Jack. This was a very special reunion for me since Kaptain Jack was the very first country deejay to ever interview me when all of this first started. Kaptain Jack is a great, warm hearted man who loves to give new artists the opportunity to be heard, and he has an amazing vision for where Internet country radio is headed. After a live on-air interview and performance with Kaptain Jack we chatted and took pictures before heading to the next radio station. 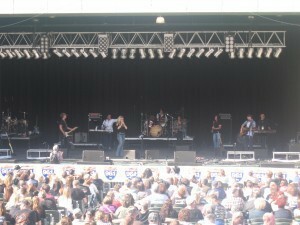 Next, I went over to meet with Cody Alan at CMT Radio Live, performing for him and taking some photos. Cody and I will be meeting up again when he comes to WJVC My Country 96.1 FM on Long Island later this year for a visit. Cody mentioned that he liked how he can sometimes hear my Long Island accent, declaring that it made me stand out among a sea of southern country artists :). On Friday, September 1st, we headed over to Cookeville, Tennessee and met up with WGSQ Country Giant 94.7 FM, which is a 100,000 watt country format radio station. I met Philip Gibbons, a real sweetheart, and Joey Sykes and I gave a live on-air performance and interview. I sang “Wouldn’t You Like to Know?” and “Somebody’s Baby,” and then Philip played “Me Time” live on the air. Having “Me Time” officially added into the rotation at WGSQ, which is such a big Nashville country radio station, was a major accomplishment for me and my team. Next, we headed to Lawrenceburg, Tennessee to visit WLLX Power 97.5 FM, a 50,000 watt country radio station serving the Southern Tennessee area. As I walked into the radio station the feeling was like walking into the living room of a cozy little home. The women working in the office were so warm and friendly to me and I felt very welcomed. I met with deejay Dan Hollander for the Afternoon Drive and gave a live on-air performance and interview. We spoke at length about my career and where I hope to see myself in the next year. Dan is such a sweet person and really knows his country music! He is also a proud supporter of the town of Lawrenceburg and recommended we visit a beautiful little Amish community called Ethridge when we return to Lawrenceburg. I’m definitely looking forward to doing just that when I return to Tennessee at the end of September.